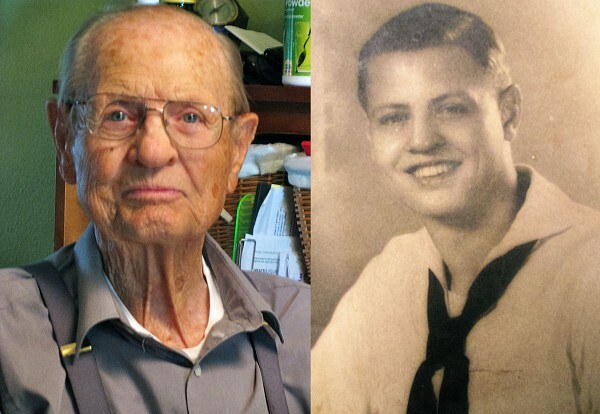 Bay City native Fred Sauer, as a 21-year-old graduate of the Great Lakes Naval Training Station in 1943 and today as a 94-year-old retiree in Arcadia, Florida. A former Bay Cityan, Fred Sauer, 94, recalls serving on the U.S. Navy carrier Intrepid that has played a large part in how the destroyer USS Edson ended up as a museum ship here. Sauer, born in Munger in 1922 and now of Arcadia, Florida, was serving on the Intrepid during missions in 1944 in the Marshall Islands and Truk against Japanese ships and planes, actions making the carrier heroic ... and ... famous. The carrier is so famous that it has been the anchor vessel of New York's Intrepid Air, Sea, Space Museum -- where the Edson was stationed for a decade. It is part of one of the most famous naval museums in the world. The 872 foot long carrier was launched in 1943 at the Newport News, Virginia, shipyard. Intrepid is one of 24 Essex-class aircraft carriers built during World War II for the United States Navy and is the fourth Navy ship to bear the name. Navy historians recall the first Intrepid was an armed ketch built by the French in 1789 and sold to Tripoli, which renamed her Mastico. In 1803, during actions against Tripolitan pirates ordered by President Thomas Jefferson, the U.S. frigate Enterprise captured Mastico. Renamed Intrepid, the U.S. corsair in 1904 accomplished what British Admiral Lord Nelson called "the most bold and daring act of the age." Under Commodore Edward Preble, Intrepid's sailors blew up the captured USS Philadelphia, a frigate that had been captured after running aground off Tripoli. She met the same fate soon after when Preble used her as a powder ship aimed at destroying the Arab pirates and ships in their fortified harbor. The second Intrepid was a steam torpedo ram of 438 tons built at the Boston Navy Yard in 1874. Her life was restricted to torpedo testing and she became obsolete and was stricken from the Navy list and sold in 1894. A third Intrepid was launched in 1904 at the Mare Island, California, Navy yard as a training ship. She also served as a barracks for the Pacific Fleet and was sold in 1921. The carrier Intrepid of World War II on which Sauer served and which still draws crowds of admirers in New York sailed out of Pearl Harbor Jan. 16, 1944. Sauer's job as aviation electrician's mate was to repair the 100 Hellcat fighters, Avenger torpedo bombers and Dauntless dive bombers aboard the carrier. After helping to capture the Japanese-held islands Of Kwajalein and Eniwetok, first to fall to the U.S., Intrepid was attacked one minute after midnight on Feb. 17, 1944, Sauer recalls. He was sleeping on an engine cover and was blown into the air by a Japanese torpedo, severely injuring his back landing on the cover. "It was my own damn fault," Sauer exclaimed. He didn't go to sick bay for treatment of the injured back since that would have cost him a planned 30-day leave, he said. "I wanted to be with my wife Frances because we had gotten married right before the Intrepid sailed," he recalled. Despite the back injury, Sauer was one of the lucky sailors; 11 men had been killed and many more injured severely. "I head these men screaming until they died. It still gives me nightmares even to this day." Intrepid reached Pearl by the most amazing means; planes with their engines running pulled the ship along supplemented by canvas sails got her to Pearl where a temporary rudder was installed. While Intrepid was in for repairs at Hunter's Point, San Francisco, he took a five day train ride back to Bay City for a reunion with Frances. Back aboard in June of 1944, Sauer was aboard in the Phillipines under Admiral Bull Halsey commanding the Third Fleet. Intrepid took five kamikase suicide plane hits during the Battle of Leyte Gulf in November, 1944. The U.S. carrier lost 60 men, with 18 missing and 100 wounded. Before the war was over a "Halsey's typhoon" hit the Intrepid and sunk three ships. "We were on general quarters all the time, day and night," he recalled. Again in San Francisco for repairs, Intrepid sailed back into battle in mid-February 1945 without Sauer who had been transferred to Rhode Island where he worked on Hellcats for the last four months of the war. 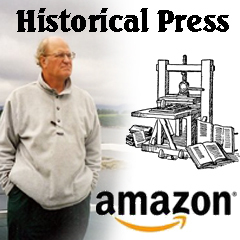 Back problems caused him to quit the machinist's job he had held before the war and he and Frances moved to St. Petersburg, Florida. Spinal fusion was done on his back at the VA hospital in St. Pete. "It sort of helped but didn't cure my medical problems completely," Sauer said.He never got disability because his injury was not recorded. He and Frances (nee Woods) have been residents of Arcadia, Florida, since 1971. They have five children, Gary, Twyla, Ronald, Rob and Roland. My father very much enjoyed it, as did the rest of the family. There aren't very many of his era left. Thanks again for spotlighting them.